Last year was the second wettest year in the UK on record and the rainfall is set to increase, according to the Met Office. Provisional statistics released today reveal that during 2012, the persistent wet weather amounted to 1330.7 mm of rainfall, which is just 6.6 mm short of the record set in 2000. 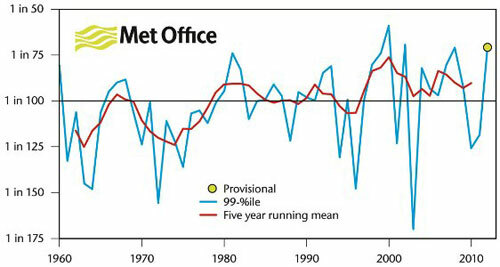 However 2012 was the wettest year on record for England. The records go back more than a century to 1910. The year began with a drought, leading to hosepipe bans accross Southern and Eastern England, but quickly gave way to wet weather and floods - with April and June being the wettest on record. The Met Office claims that preliminary evidence suggests the UK is getting more rain and that it may be falling in more intense bursts. Global warming could be a factor in the UK's wetter weather it added. A warmer atmosphere can hold more moisture and the UK has seen an increase of about 0.7C in global temperatures since pre-industrial times. The Met Office claims that by using "basic physics", this would equate to about a 4% increase in moisture in the atmosphere which means there is a greater potential for heavy rain. Four of the top five wettest years have occurred since 2000. Looking at annual rainfall for the UK, the Met Office says, "we can see the country as a whole getting wetter in recent decades." Long-term averages of 30-year periods show an increase in annual rainfall of about 5% from 1961-1990 to 1981-2010. The research also suggests that the UK has seen a change in the nature of the rain it gets, with 'extreme' daily rainfall becoming more frequent. An analysis of 1 in 100 day rainfall events since 1960 indicates these 'extreme' days of rainfall may have become more frequent over time. Graph showing the frequency of 99 percentile rainfall in individual years in the UK. Met Office chief scientist Professor Julia Slingo said: "The trend towards more extreme rainfall events is one we are seeing around the world, in countries such as India and China, and now potentially here in the UK. "Much more research is needed to understand more about the causes and potential implications. "It's essential we look at how this may impact our rainfall patterns going forward over the next decade and beyond, so we can advise on the frequency of extreme weather in the future and the potential for more surface and river flooding. "This will help inform decision-making about the need for future resilience both here in the UK and globally." “Make no mistake, climate change is already having a major impact on Britain. “Experts including the Met Office expect extreme weather events, such as intense rainfall, to become more common as global warming takes hold. “So far the world has warmed by an average 0.7 degrees centigrade above pre-industrial levels - if temperatures rise by the four degrees scientists widely predict then we can only begin to imagine the impacts on our lives and livelihoods."